Link for this Page HOME > FAQ > What is a CO2 Reduction Certificate? A CO2 Reduction Certificate is a certificate that proves that the owner of the certificate has reduced Green House Gases. How do you reduce Green House Gas Emissions? The following figure shows the actual and future projection of green house gases emissions by economic groups. On the bar graph Developing Countries (light orange), U.S.A (light purple ) , Other Countries(light green). The blue line represents the emission reduction target set by the Kyoto Protocol for the light green Countries and the light blue area shows the reduction amount compared to 1990. The letter "CDM" on the top of the middle bar shows the portion of emission reduction achieved through the Clean Development Mechanism of the Kyoto Protocol and emission credits are issued from that part. An emission credit is a right that grants the owner of that credit to emit Green House Gases once for the equivalent amount. In other words, it is used in cases where an entity cannot meet its reduction targets. The ordinary emission credit would follow the RED LINE (A. Retire) where the emission credit will be used to offset emissions by whoever needs to meet its targets. 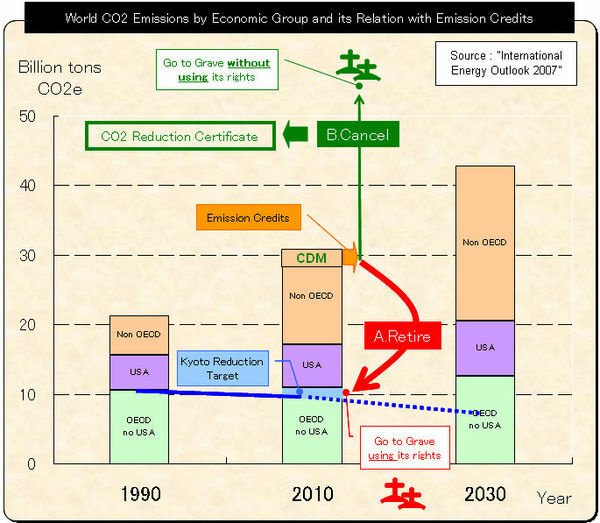 On the other hand a CO2 Reduction Certificate will follow the GREEN LINE (B.Cancel) where the emission credits will be shelved without the right being used and therefore achieving an actual reduction within the Kyoto Mechanism. When one views this graph he/she might think "What in the world are the Developing countries (light orange) thinking emitting more and more green house gases in this situation where global warming is progressing?" But roughly about 80% of the people on earth are within the Developing countries area (light orange) and 20% on the rest (light green + light purple). We assume you reading this would be within the 20% side but what do you think? Why reduce in developing countries and not in our own country? Because in a situation where you simply buy reduction it is cheaper that way. In the case of Japan, the Ministry of Economy Trade and Industry has reported that reducing a ton of carbon in Japan will cost nearly 500 USD. The reason is said to be because Japan is already very energy efficient. On the other hand, the current(Jun 2008) price of emission credits in the market is less than 10% of that. One of the unique characteristic of emission credits is that a domestic ton of reduction has the same effect as a ton reduced on the other side of the earth. Also the efforts put into that reduction does not matter at all. Our CO2 Reduction Certificate is a product that sells the value of reducing Green House Gas emissions. Our goal is to deliver you the most effective reduction with the least price while guaranteeing the reliability and quality of that reduction. Will purchasing a CO2 Reduction Certificate contribute to resolve Climate Change? First of all, we must admit that although it is considered to be an effective method, it is still uncertain if buying a CO2 Reduction Certificate will directly solve Global Warming. There are two reasons. First of all, the common belief that reducing anthropogenic GHG will lead to solving Global Warming is an assumption only and will probably remain an assumption for a long time. Secondly if so, we do not know if the Kyoto Protocol (Like) Mechanism will evolve into an effective measure to put a real cap on global anthropogenic GHG emissions. The possibility of you directly contributing to stop Global Warming will be dependent on the effectiveness of these factors that will surly unravel in the future. However there is a reason to why we have answered "Yes it will". It is obvious that CO2 is a garbage that human kind is dumping into the atmosphere without being able to predict exactly what the consequences are. At the same time humans will have to adapt to this new environmental future whatever the outcome might be. Under these circumstances we are confident of our product and believe that a person who has purchased a CO2 Reduction Certificate will have purchased a CO2 garbage processing ticket that is of the highest quality within the existing system. More than the reduction effect itself, this has a strong meaning and sends an intense message to the market that another entity has really opened up his/her wallet and admitted that protecting the environment has a real value which can be traded for real money. We do not think that reversing capitalism or economic growth is a realistic option. If so we the only way to tackle global warming and/or other environmental problems is to create a situation where this new environmental value is widely acknowledged and is mixed up into the current market system in a sufficient ratio. CO2 Reduction Certificate exists to embrace this concept and tries to maximize and leverage your brave actions. So please try out our products and we will be waiting for your feed back . Is a CO2 Reduction Certificate a carbon offset? In a broad definition YES, in a narrow definition NO. "An act of an entity that is a participant of a society such as a citizen, a corporation, a NPO/NGO, an autonomy or a government to (A) Recognizes its GHG emissions (B) Willingly put in efforts to reduces its own emissions (C) offset part or all of its inevitable emission by purchasing emission reduction credits or implementing projects that reduce GHG emissions in another location." We agree fully that this is a good practice of Carbon Offset but at the same time is not the only form of Carbon Offset. Under the strict definition of Carbon Offset it must follow the next steps (A) Know your own emission amounts (B) Reduce your own emissions (C) Offset the inevitable emissions by other sources. This would be a very nice and precise tool for those who do not thinks this is a awkward procedure. However the flip side of the coin is that people who think that this is a awkward procedure will never try it. The characteristic of Global warming is that it is your problem as much as it is for every other human being on earth. We consider that the following senses are important to you as much as knowing about yourself when you need to make decisions on this problem. (A) be able to compare situations between countries (B) know that carbon dioxide is number that has no boundaries and accumulate on this planet no matter where it might have been emitted (C) Have the same knowledge base amongst as many people as possible. Now when we capture Carbon Offset from a broader point of view we can probably say that "Carbon Offset is an act to learn something about Global Warming whilst reducing Green House Gases". With these intentions we provide you our CO2 Reduction Certificates without imposing any efforts for self reduction or emission calculations. Is a CO2 Reduction Certificate a pardon? There might be people who criticize us that simply selling reduction certificates without imposing any self efforts for reduction to a person is the same as handing out pardons. We do not believe so. The first reason is that pardons are things that can be issued without any grounds. On the other hand a CO2 Reduction Certificate is issued under a justifiable basis(Please refer to certificate section of theTerms and Conditions for details. A portion of the money paid for the certificates is guaranteed to indirectly go to emission reduction projects or bodies that execute those projects and will help other projects yet to come. Secondly, people who become owners of a CO2 Reduction Certificate will gain an environmental value and wear that image on themselves. This will also mean that they have expectations from others. In order to keep on meeting those expectations, the owners must consider between purchasing again or consider reducing their carbon emissions by another method. Further, the price of carbon emission credits change on a daily bases on the market. It is predicted that the credits will become more and more expensive as it gets harder and harder to reduce. The CO2 Reduction Certificate that you might have thought would be a pardon for yourself this year has not guarantee that it will be the same price next year. We are sure that becoming an owner of a CO2 Reduction Certificate will introduce effective measures against Global Warming some where else on this planet. But at the same time we also strongly hope that it will mean one more person who understands the real cost of carbon who can lead the debates on this issue in a more logical manner.